"Think Yourself Young should be prerequisite reading for anyone over forty. We have a cultural concept that equates aging and suffering, yet Peter cuts through this self fulfilling prophecy on the physical, metal and spiritual levels. He presents a road map of how we sabotage ourselves into using advanced age as an excuse for suffering, and then eloquently and instructively provides practical instruction on how to break this cycle. There is no magic bullet for perpetual youth, but there are readily applicable methods to assure a youthful quality of life n matter how old we are. As a licensed Naturopathic Doctor with over 20 Years of experience I can attest to Peter Baksa.s wise instruction that is a must read for all who are committed to taking charge of their health." 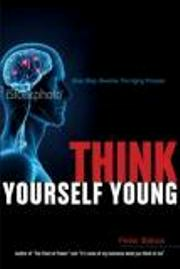 "Think Yourself Young is an amazing and powerful compilation of powerful medicinal, physical, and mental strategies that take the reader to another level of looking at things like diet, lifestyle design, and most importantly how one’s thinking about aging and health is in direct connection with the net result." It is said that death and aging are inevitable parts of life, but is this the whole truth? Can life be greatly extended, age post-poned? If belief in a thing makes it so, then there is a way out of the cycle of aging and death. Abandon the misperceptions of life and aging, summon up the courage to face life's simple fundamental truths, and you can lead a more youthful joyous life, by simply making the right physical, mental, and dietary changes to your current lifestyle. In this book we will examine some of the misperceptions connected up with why we age, look into why such concepts are wrong and even the thought of them harmful. With the help of the latest research in medical science, quantum mechanics, and a look back to ancient texts, we will see how the aging process that humans experience is largley preventable, and in some cases reversible.